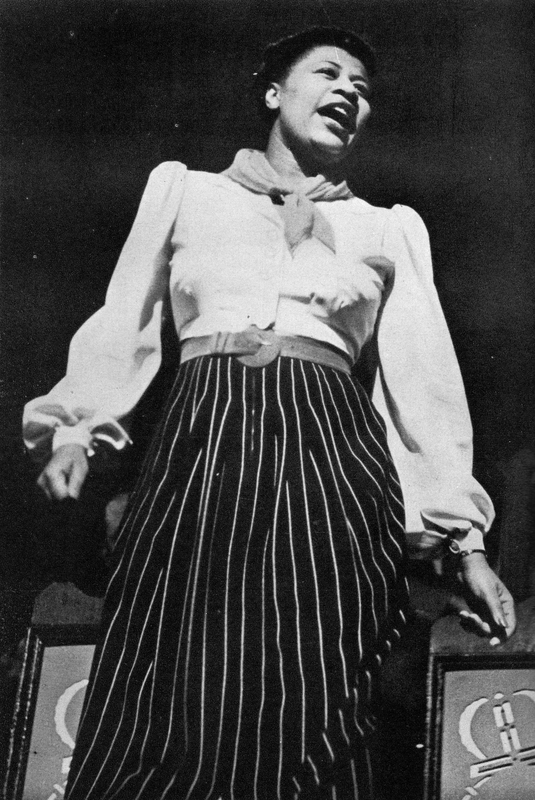 Ella Fitzgerald in the late 1930s. From Jazzmen, 1939. In the mood for a bit of swing? I hope so, because today we celebrate birthday of the First Lady of Song, Ella Fitzgerald. Decca 1840 was recorded in two sessions in May of 1938, the first on the second and the second on the third. The band consists of Mario Bauza, Bobby Stark, and Taft Jordan on trumpet, George Matthews, Nat Story, and Sandy Williams on trombone, Garvin Bushell on clarinet and alto sax, Louis Jordan (yes, that Louis Jordan) on alto sax, Teddy McRae, and Wayman Carver on tenor sax, Tommy Fulford on piano, Bobby Johnson on guitar, Beverly Peer on string bass, and Chick Webb on drums. Ella’s first big hit was “A-Tisket A-Tasket”, which she and Al Feldman adapted as a pop tune. The arrangement was written by the recently departed Van Alexander. 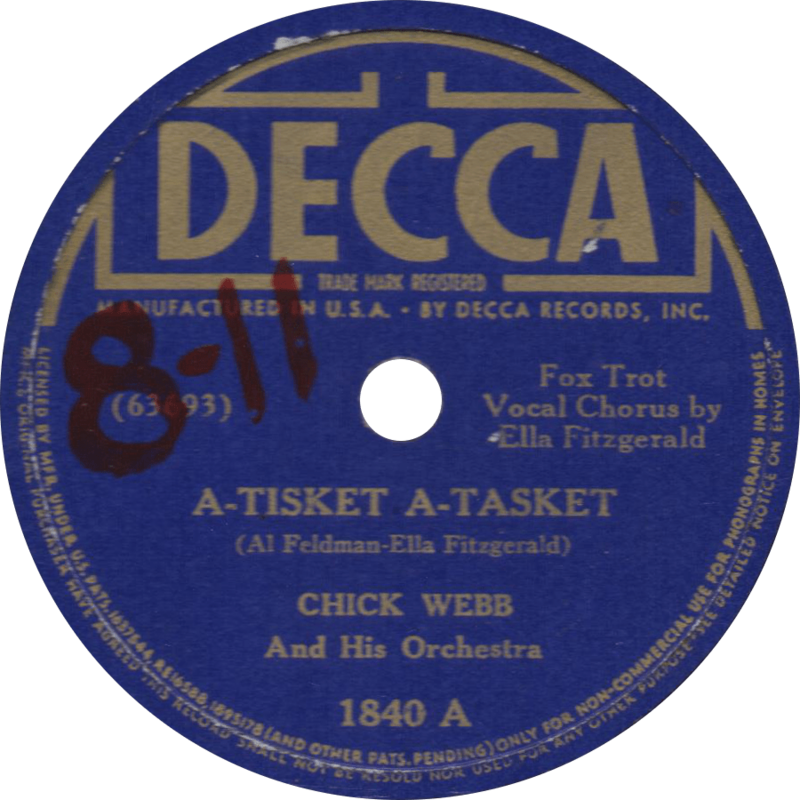 A-Tisket A-Tasket, recorded May 2, 1938 by Chick Webb and his Orchestra. 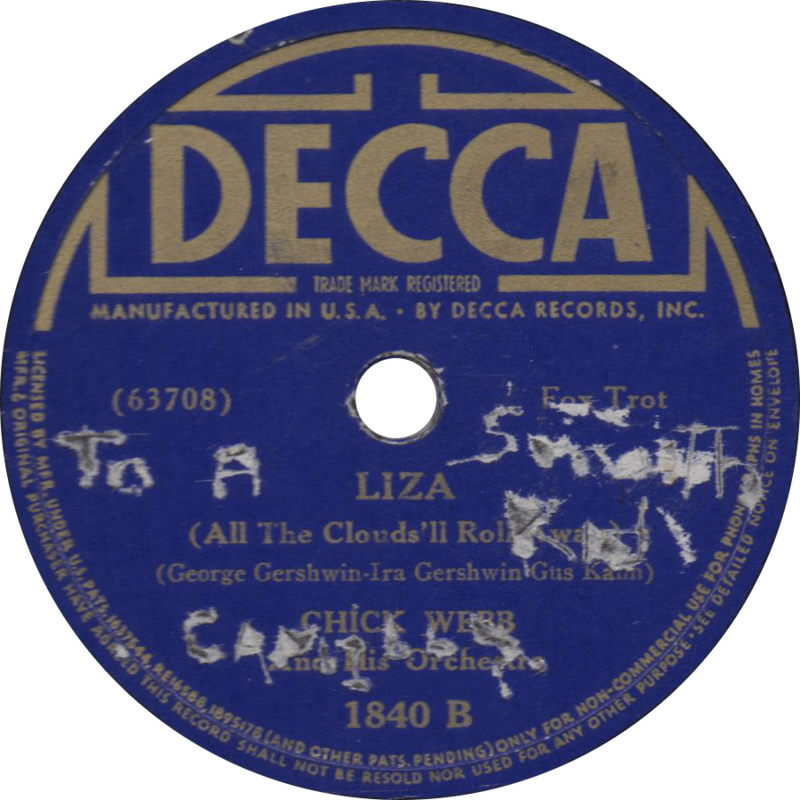 The label of the flip-side “Liza (All the Clouds’ll Roll Away)” bears the inscription “”To a Swell Kid, Camilla.” Unseen in the scan is “To Marilyn From Camilla Adams 1938” engraved in the run-out with some sharp instrument. Liza (All the Clouds’ll Roll Away), recorded May 3, 1938 by Chick Webb and his Orchestra. This entry was posted in Records and tagged 1930s, 1938, Beverly Peer, Bobby Johnson, Bobby Stark, Chick Webb, Decca, Ella Fitzgerald, Garvin Bushell, George Matthews, Harlem, Jazz, Louis Jordan, Mario Bauza, Nat Story, New York, Sandy Williams, Swing, Taft Jordan, Teddy McRae, Tommy Fulford, Wayman Carver by R. Connor Montgomery. Bookmark the permalink.